Building off #2760, this will allow dev server to watch for changes in the src/node_modules directory. Hello! I'm a bot that helps facilitate testing pull requests. Your pull request (commit b0ef885) has been released on npm for testing purposes. Note that the package has not been reviewed or vetted by the maintainers. Only install it at your own risk! I do not believe this regex works. paths.appSrc actually never has the trailing slash, but I dunno if we'll guarantee this in the future. To ensure the trailing slash (and fixing the src2 problem), let's do path.normalize(paths.appSrc + '/'). watchOptions didn't change on 0.9.5 -> 1.0.0. So what exactly did cause the change in watcher behaviour? If the behaviour changed because of some dependency update, then maybe we can fix that dependency? hmm. it is interesting :D do you mean it did never work or did it work in a way that it shouldn't? I used src/**/node_modules from the beginning (I think it was a bit lower than 0.8.4) and it worked. Last week I updated 0.8.4 -> 1.0.14 and I noticed that the watcher doesn't watch any more :(. Then I found out the lastest working version was 0.9.5. It should never of worked, this goes back to v0.2.1; see #294. If it did work, it was because of a bug in WebpackDevServer. Since WebpackDevServer fixed their bug (speculation based on your comment), this stopped working. 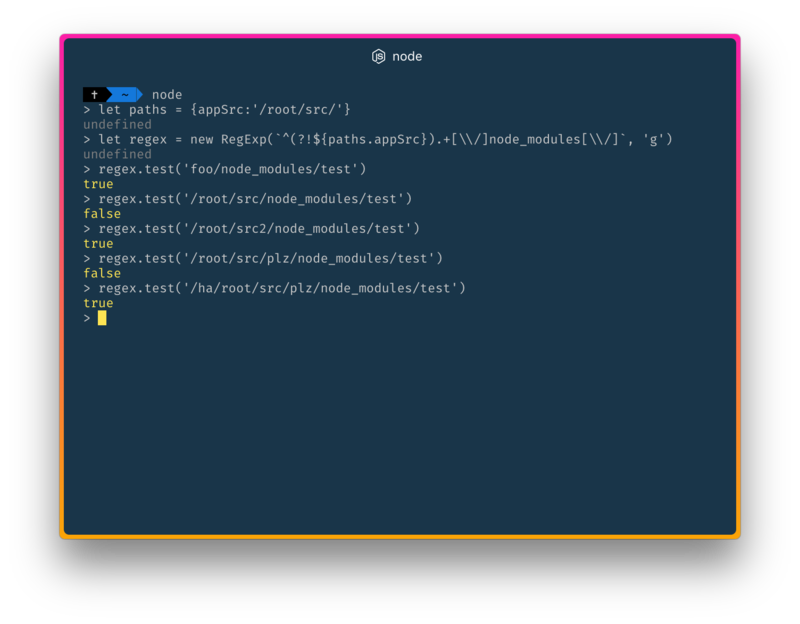 This regex change will allow src/**/node_modules to be watched again. Note that technically this stays in ejected projects forever. It looks extremely cryptic. Can we extract this somewhere to react-dev-utils?